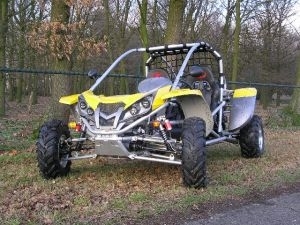 Renli 500cc is available in both 4x2 and 4x4. Both 4x2 and 4x4 have a CVT (automatic transmission), furthermore the 4x4 also has a high and low gear what makes the Renli 500cc all-terrain suitable. Partly because of the size of this buggy it is highly suitable for larger buggy enthusiasts. The digital dashboard is clear and shows all the important indicators. This buggy fits the 4x4 group, which also includes the XY, BXR_5, Dasy, Grizzly, Koyote, Destroyer, NBluck, Rovach, CF Moto T500, Tension and DongFang.